Paged media (e.g., paper, transparencies, pages that are displayed on computer screens, etc.) differ from continuous media in that the content of the document is split into one or more discrete pages. 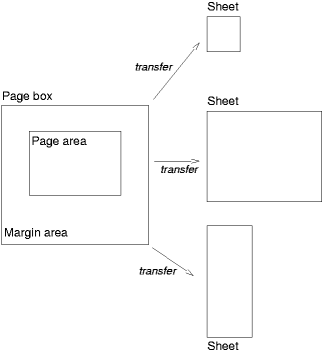 To handle pages, CSS 2.2 describes how page margins are set on page boxes, and how page breaks are declared. The size of a page box cannot be specified in CSS 2.2. The page context has no notion of fonts, so 'em' and 'ex' units are not allowed. Percentage values on the margin properties are relative to the dimensions of the page box; for left and right margins, they refer to the width of the page box while for top and bottom margins, they refer to the height of the page box. All other units associated with the respective CSS 2.2 properties are allowed. If a forced break occurs before the first generated box, it is undefined in CSS 2.2 whether ':first' applies to the blank page before the break or to the page after it. This section describes page breaks in CSS 2.2. Five properties indicate where the user agent may or should break pages, and on what page (left or right) the subsequent content should resume. Each page break ends layout in the current page box and causes remaining pieces of the document tree to be laid out in a new page box.